Diesel-powered Skyactiv-D in Mazda CX-5 available in Europe, not U.S. The EPA last year certified a 2.2L version of Skyactiv diesel in the Mazda CX-5 CUV, but the engine is not in the U.S.-market CX-5 or any other Mazda. A spokesman says don’t take that as a sign Mazda is waffling on offering a diesel in the U.S.
OLYMPIC VALLEY, CA – While it has been teasing their arrival in the market for years, it remains unclear when Mazda’s new Skyactiv D (diesel) and X (spark-compression ignition) engines will arrive in the U.S.
“We generally feed those things in piece-by-piece and generally those are launched based on market need, and right now the U.S. is not the primary market that needs those,” Dave Coleman, vehicle development engineer-Mazda North American Operations, tells Wards here during a ’20 Mazda3 media drive. “Those are primarily needed in Europe” to meet emissions regulations, he says. 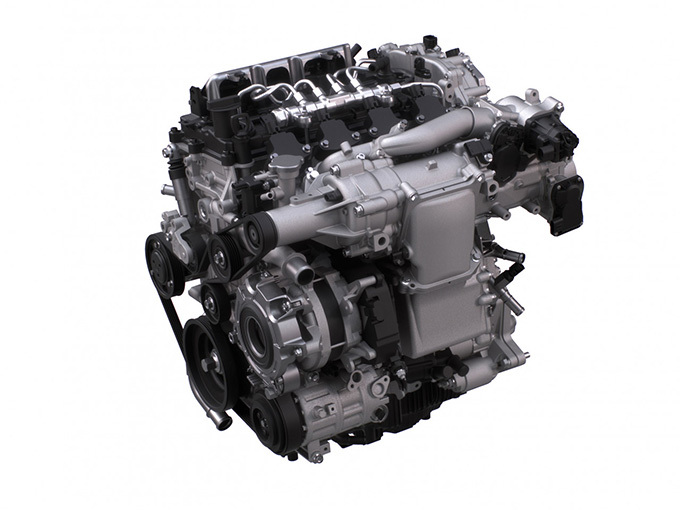 The Skyactiv D, Mazda’s latest-generation diesel engine, promises cleaner, multistage combustion. Mazda says the engine has a two-stage twin turbocharger with variable turbine geometry and claims a diesel-record-low compression ratio of 14.0:1. The EPA last year certified a 2.2L version of Skyactiv-D in the Mazda CX-5 CUV, rating the vehicle’s fuel economy with the engine at 29 mpg (8.1 L/100 km) and 28 mpg (8.4 L/100 km) combined in front- and all-wheel-drive versions of the CX-5. The engine is not in the U.S.-market CX-5 or any other Mazda vehicle. But a Mazda spokesman says don’t take that as a sign the automaker is waffling on offering a diesel in the U.S.
Diesel scandals at Volkswagen and FCA have given the technology a black eye, as have moves by governments in Europe to ban diesels. Hyundai is one automaker that was going to offer a diesel engine in the U.S. and has canceled plans to do so. Mazda also won’t divulge when it will debut the Skyactiv-X engine (below, left) in the U.S. The gasoline mill promises diesel-like efficiency and torque via spark-controlled compression ignition technology. When Mazda debuted the engine at the 2017 Tokyo auto show, it said it would arrive in the market in two years. It is expected to be available later this year but in Europe, debuting in the new CX-30 CUV that slots between the CX-3 and CX-5. In European versions of the new Mazda3, the Skyactiv-D and Skyactiv-X engines are available, making about 116 hp and 179 hp, respectively. In the U.S.-spec Mazda3, on sale now, only one engine is available, an updated version of the CX-5’s 2.5L naturally aspirated 4-cyl. making 186 hp. Skyactiv-X is considered a part of Mazda’s hybrid and electrification plan as it has start/stop, or the ability to automatically turn off and turn back on the engine at idle, but a Mazda engineer here hints at bigger forays into the green sector by the automaker. “Soon we can show you the GVC concept for an electrical vehicle. It’s going to be a really seamless torque-controlled vehicle, so it’s going to be a very Mazda-unique electrical vehicle,” Yasumasa Imamura, AWD system engineer for Mazda, says in response to a media inquiry. Masahiro Moro, Mazda North American Operations president, told Wards in January 2018 Mazda would bring an electrified vehicle to the U.S. in 2020 to comply with California Air Resources Board mandates to lower vehicle emissions in the state. At the time, he said Mazda could bring back the rotary engine it popularized and single-handedly kept alive to act as a generator in a hybrid application. Mazda has partnered with Toyota to develop electrified vehicles, and Toyota showed an e-Palette autonomous concept vehicle at the 2018 CES. “Toyota announced the e-Palette. Mazda is a technical partner. That technical (partnership) means they need our rotary range-extender technology,” Moro said.